We're going to buy a lucky user a game off of their wishlist before this coming holiday season! Before we get into the rules for it I wanted to share a bit about everything that's changed recently on our board game search platform. In the last 7 weeks, we've built and released a new board game search platform. It features a growing number of amazing features that make it the world's most powerful way to search for boardgames. Here's some of the sweet features that the web app includes. That's enough about features. If you want to check out the search web app, you can see it at https://www.5colorcombo.com/search. How do you get the chance to win a game that you've been waiting for? Simple. The only requirements are a 5 Color Combo account and the use of our game list feature! Beginning today and running until November 20, 2018 add any game's you'd like to win into your 'Wishlist' and you could win one of them! Although only games at MSRP $60 or less qualify to win, you can add any games you want to your list! We'll speak with the winner and decide on the game together before purchasing. Here's the quick guide on how to use the feature. Go to the 5CC Board Game Search. Click on a game that you're interested in. Under the game's main image in the 'Save' section, click on the 'Add to a List' link and select Wishlist. You need an account to do this so create one if you haven't already. Repeat steps 2-3 as many times as you want! We'll be randomly picking an account with games on their Wishlist on November 20, 2018 and buy them a qualifying game to be sent to them! Good luck to everyone who participates! Don't See A Game You Want? If you don't see a game that you want to add to your list. That's okay! You can add it to the database yourself! This is wiki style database and it only takes about 120 seconds to add a game with the basic details! 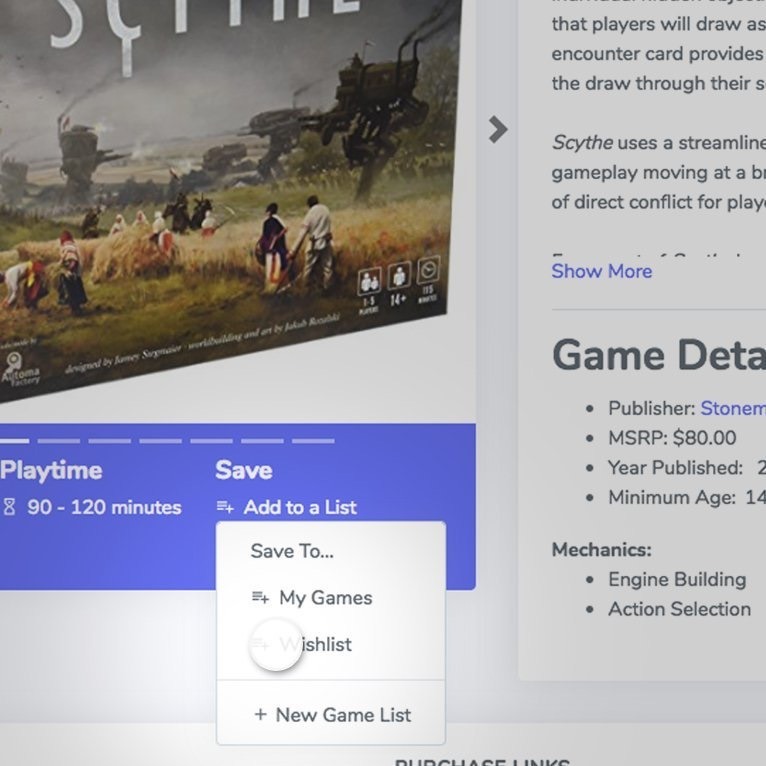 Go to the bottom of the website and click Add a Game under the Contribute section to add a game and get it on your Wishlist! Trent Ellingsen is a board game enthusiast. He has played Magic: the Gathering for about 7 years but more recently was shown the much larger world of board games. His passion for Magic: the Gathering led him to create 5 Color Combo and through a series of events he created an MTG companion app, partnered to make custom gaming playmats, designed and published 3 board games, and is now focused on Board Game Atlas.